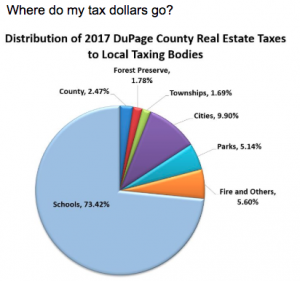 Oak Hill and Oak Crest cemeteries are located between Maple Avenue and Howard Street, in unincorporated Downers Grove, and Lisle Township. The Oak Hill Cemetery was a large piece of land in 1835 when it was purchased by Dexter Stanley. In the 1800s, residents of the community mostly used the Main Street Cemetery. But due to flooding and icy conditions from St. Joseph Creek, burying people there became difficult. Residents eventually reached out to Stanley for help and he donated part of his land, which was one of the highest points in this area. It was originally called the Westside Cemetery. Some local families buried at Oak Hill are, Downer Stanley, Dixon, Carpenter and Rogers to name a few. The Oak Crest Cemetery is located between Howard Street and Elmore in unincorporated Downers Grove and part lies in Lisle Township. Oak Crest, once called Blodgett, was a privately-owned cemetery. During the life time of Mr. William Blodgett he sold lots in Oak Crest, but at no time did he own the land. Records show that in August of 1936 Florence L. Kester and her husband Reg. Ekstrom Jr. were the owners of the land. On December 5, 1936 the Kester’s conveyed the cemetery property to Edith Blodgett. Mr. Blodgett died on February 8, 1933 On March 22, 1939 Ms. Blodgett conveyed part of the property to Olive M. Carlson. Records also show that on May 15,1945 Olive M. Carlson conveyed the cemetery to William and Harriet Prince Parrish. On July 17,1945 Edith G. Blodgett conveyed the remaining land to the Parrish’s, also. In 1960 before William Parrish died, he sold the land to Fred & Mae Marvin who already had Oak Hill. Since they could not afford a high price, Mr. Parrish sold it to them for $10.00. The first women elected to both the Illinois House of Representatives and Illinois State Senate, Lottie Holman O’Neill, is buried at Oak Crest along with members of the Cooper, Parrish and Herrick families. Additionally Duke Schluder and former Downers Grove Postmaster Kellog are buried there. 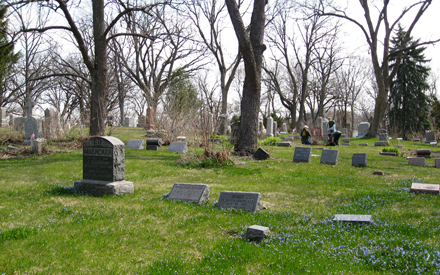 Since 1985 the Downers Grove Township has been the caretaker of Oak Hill/Oak Crest Cemeteries. Although all the lots in Oak Hill have been sold, people are still able to buy lots in Oak Crest. Many of the original lot owners in Oak Hill are still being buried there today. If you are interested in buying lots please contact the Supervisor’s office at (630) 719-6610.